Listen to their conversation here! 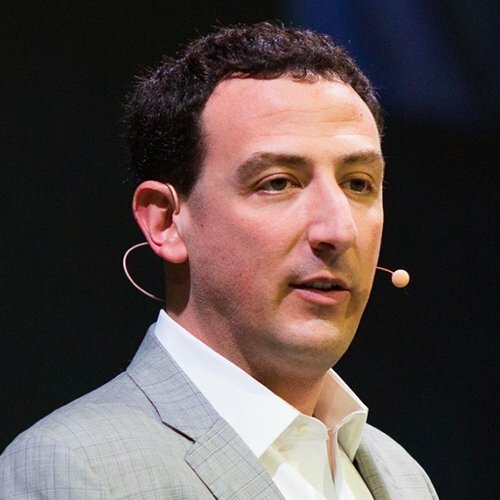 In his popular new TED Talk "What reality are you creating for yourself?," former Saved by the Bell teen star-turned-entrepreneur Isaac Lidsky recalls how the sales person he waved to in the store was really a mannequin, and how he reached down to wash his hands and realized it was a urinal and not a sink. He learned of his diagnosis at thirteen: Retinitis Piegmentosa, a degenerative eye disease that would lead to his blindness by age 25. 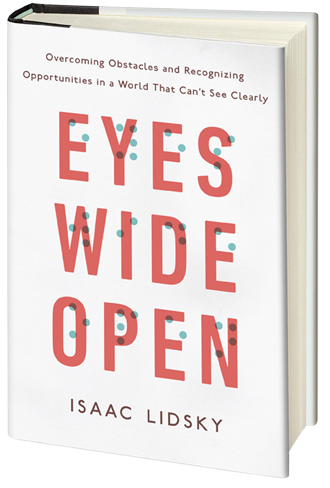 After initially believing his blindness signaled the end of his independence and achievement, Lidsky found other pathways of perception, turning his life around with his Eyes Wide Open philosophy. He graduated from Harvard Law School, worked as a law clerk under the guidance of Sandra Day O’Connor and Ruth Bader Ginsburg, and eventually became a highly successful entrepreneur and family man. 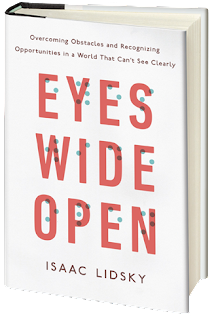 In his new book EYES WIDE OPEN: Overcoming Obstacles and Recognizing Opportunities in a World That Cant’s See Clearly, Isaac Lidsky probes the many facets of perception, detailing the neuroscience of sight and drawing on his own experience to show how our perception shapes—and often limits—our reality. · listen with “eyes wide open” to better understand what others are communicating. Isaac Lidsky shares how to live with freedom from self-limitations and to lead life with deeper awareness, understanding, accountability, and success. Isaac Lidsky has an eclectic resume. He played “Weasel” on Saved by the Bell: The New Class; graduated from Harvard College at age nineteen with a degree in mathematics and computer science; graduated from Harvard Law School and served as a law clerk for Supreme Court Justices Sandra Day O’Connor and Ruth Bader Ginsburg; transformed a struggling $15 million concrete subcontractor into an industry-leading $150 million business; and founded Hope for Vision, a nonprofit that funds the development of treatments for blinding diseases. Lidsky was born with Retinitis Pigmentosa, a rare degenerative disease of the retina that caused him to gradually lose his sight. Lidsky lives Florida with his wife and four children. Learn more at www.Lidsky.com.